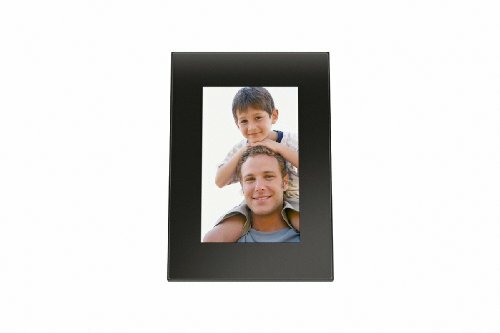 Bluetooth-ready, 9 digital photo frame is a handy device that lets you view and share your memories on a WVGA wide-screen LCD. Playback includes a still image, slideshow of images, and 14 designs of a clock/calendar display. 1GB internal memory holds 2,000 images up to 48 megapixels in JPEG and RAW formats. You can add even more images with direct USB input and multi-card slot that supports MS, SD, CF and xD. The Auto Orientation Sensor lets you place your frame either vertically or horizontally, and the image will rotate automatically to the correct orientation. Digital frame also features a convenient alarm function, remote control, 15:9 aspect ratio, WVGA 800 x 480 resolution, zoom function, multiple power on/off setting, and search function. AC-powered digital photo frame requires an adapter (not included) for Bluetooth operation.